From time to time, I stumble on articles which I think should be shared with the general public. This one from Salon is a dozy. In it, they talk about efforts for the University of Chicago Business School to teach both free market principles and ethics to its students. If you follow the article you will notice that the instructors are deeply conflicted by the behavior of their students to rig the biding systems for classroom assignments. There are many different schools of thought about business and ethics from free-for-all enterprise champions who say that everything and anything should be for sale to the moralistic ideas of Utilitarian thinkers who feel that commerce should be part of a calculus of pleasure. I happen to reside in the squishy middle. I feel that both the letter of the law and the spirit of it should be obeyed which would make me the wrong kind of person to work at an insurance company or financial firm. These types of organizations make their living with fine print and written expectations. It is not a world for me. I crave structure so that business can be conducted in an atmosphere of trust and respect. Thus, when someone doesn't pay me I reserve the right to deny them service. Likewise, if I don't meet their expectations then I have to perform some kind of appeasement to satisfy the customer. It is a world of give and take. This is why I think that America has a pretty good business environment. Property rights are respected and enforced by courts. I have a military and police to protect my business. Finally, the rules and regulations are easy to follow and establishing a business is easy. I suspect this is why people still come to this nation. We have the freedom to succeed or fail on our own terms. We also have the security from criminal behavior and unscrupulous business people to conduct business in an atmosphere of trust. It is by no means perfect but it is better than what the rest of the world can muster right now. So what do I do about students who arbitrage points for classes. Nothing, but I do point out to the first year students that the people involved in arbitrage are not doing trustworthy business and that the cost is not going to be worth the benefit. The invisible hand of the market not only works on logic but on perception and shaming a poor business practice seems better than regulating against it. It sound naïve but peer pressure is a wonderful tool for good behavior. How to you stare into the darkness? Being an entrepreneur can give you huge moments of light and tremendous moments of darkness and despair. Currently, I am in one of those moments of despair as I fill out grant paperwork, solicit customers, and try to grow the business. Everything came to a crashing halt this week after a trade show; I was burned out and decided to take a few days off and unplug. I left my mobile phone at home, took off in the car and didn’t answer email or twitter for almost three days. It was very refreshing and gave me a chance to take stock in my life and try to put things in perspective. I have dreams of being my own boss. Those dreams are still real. They just seem further away because I have not had the chance to concentrate on it full time. I am going to try and focus this dream and try to make it a success. We will be doing a website redesign, hire an additional sales person, and try to drum up our first client. Many people go into business for different reasons. My main goal was to escape the insanity of corporate life. I also want to be a different kind of business person someone with a product that works and who respects the community he works in. It sounds like a fantasy but it is one I hold dearly. Business can be a force for good in the community and I think I am just the kind of business person to do it. In that vein of thought, E3 systems is participating in J.P.Morgan Chase’s Mission Small business program and we hope that you promote ushere accordingly. We will also be reaching out for grants, aid and customers where we can get them. I hope you will take some time to support us and grant us a little bit of light during our dark times. Windows 8 gets my attention like a great pin-up girl. If there is any constant in the technology industry it is change. Seven years ago Mark Zuckerberg was a misfit Harvard dropout with a clever PHP application. Today, he is the CEO of a multi-billion dollar company and a newlywed. In my lifetime, telephones have gone from being dumb devices tethered to walls to portable computer weighing ounces which can call from anywhere. I spend much of my time struggling with these changes; Enitity Framework, MVC, and HTML5 are just some of the monsters I grapple with to stay current with latest technologies. I feel like I am being pulled like taffy. As a technologist, I have to do this because if I don't I will relegate myself to unemployment. One trend I have been noticing is that mobile phones and tablets are becoming more powerful. This power means that tasks which used to require a bar code scanner and a computer can now be done with a mobile device. This is why to ignore mobile application development is something that developers do at their own peril. This is one of the reasons why I am so excited about JQuery Mobile and MS Tag. The former makes it possible for a web developer to build mobile applications and the later makes bar code scanning obsolete. In the next ten years, you are going to see smaller and smaller devices doing more and more. Personal computing is going to resemble carrying around a notebook or clipboard. If you have any doubts about this just look at the gamble Microsoft is taking with its Window 8 operating system. While it works on a desktop or laptop it is really made for tablet devices and phones. If I am going to survive, I am going to have to learn the Metro way of doing web development and building applications. Change is constant and I wouldn't have it any other way. Phone is now a snap. A purchase order should not betray you. It is a simple piece of paper you fill out and within a few days you should receive the product requested. The reality is that faxes get lost. Vendors can be unreliable and you are stuck explaining to your boss why the purchase order has not been filled. This is a common frustration for business people. Somehow, there needs to be a better way to track purchase orders. This is what guided E3 systems when we created Sully. Instead of thumbing through catalogs, filling out paperwork, and praying the vendor gets your message; you fill out a simple form and then automatically email the purchase order to the vendor. If the vendor does not have email you can print up the purchase order and fax it. The beauty of the system is that when you e-mail a purchase order you will receive a message in the Microsoft Outlook telling you when they opened it. Now, there is no doubt about a vendor receiving a purchase order. Better yet, when you receive a purchase order you can instantly place these items into inventory with a mouse click so you have a fully updated record of all the products in inventory. 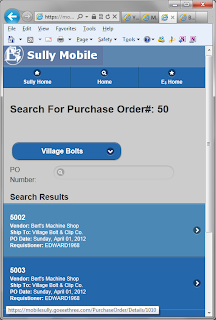 You can also track a purchase order via a mobile phone or a tablet computer with the help of MSTag. A purchase order should not betray you and at E3 systems we understand that. Contact us today and find out.